One of the surprising aspects of walking the Camino de Santiago (“The Way of Saint James”), is how little most Americans know about it. Never fear, Mikey is here! He’s put together some answers to questions most frequently asked by friends and family. Enjoy the below and feel free to send him additional questions not addressed here. In a nutshell, it is basically a Catholic pilgrimage to the Cathedral of St. James in Santiago de Compostela, Spain, where the remains of Christ’s disciple are interred. “James the Greater” was a disciple of Christ. Not to be confused with Jesus’ brother, “James the Just,” this guy was the brother of John and the son of Zebedee. While you may not know that much about church history, James was the first apostle to be martyred (in 44 CE) and was the one responsible for spreading Christianity in the Iberian peninsula. According to legend, he was summoned to Jerusalem and executed by King Herod Agrippa. Later, his remains were transported back to Spain where they were lost for almost 800 years. They were later uncovered in the 9th century and a church was consecrated near the site. Santiago de Compostela (literally “Saint James in the field of stars”) became a regular Catholic destination of pilgrimage that waxed greatly in number of followers during the Crusades as the Holy Land had become too dangerous for travel. Saint James’ feast day is on the 25th of July. Is this an organized trip/race? When does everyone start? Nope. People come and go throughout the year. It is not a competition, but if the pilgrim completes the last 100km to Santiago, he receives an official “Compostela” or certification from the Roman Catholic Church which verifies his completion of this sacred journey. Haven’t you ALREADY done this?!? Yes – TWICE already… In 2016, Mikey and his father, Frank, completed the Camino Frances (the French Camino route) from Saint-Jean-Pied-de-Port in France to Santiago. It was a hard, but enjoyable journey. In 2017, Mikey went solo and walked the Camino del Norte or Northern Camino from Irun, Spain to Santiago. 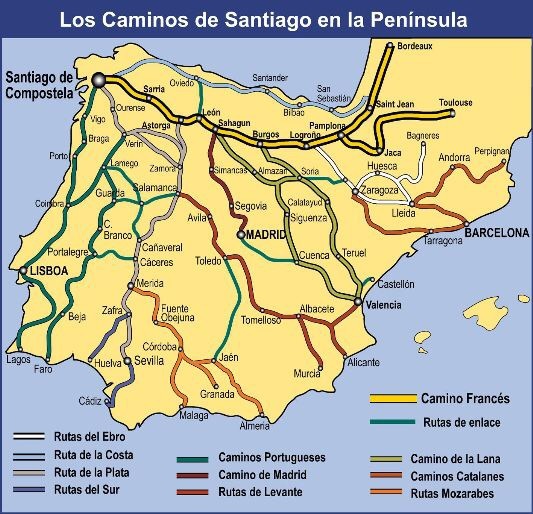 This route followed the northern coast of Spain and is completely different with the exception of its destination, Santiago de Compostela. 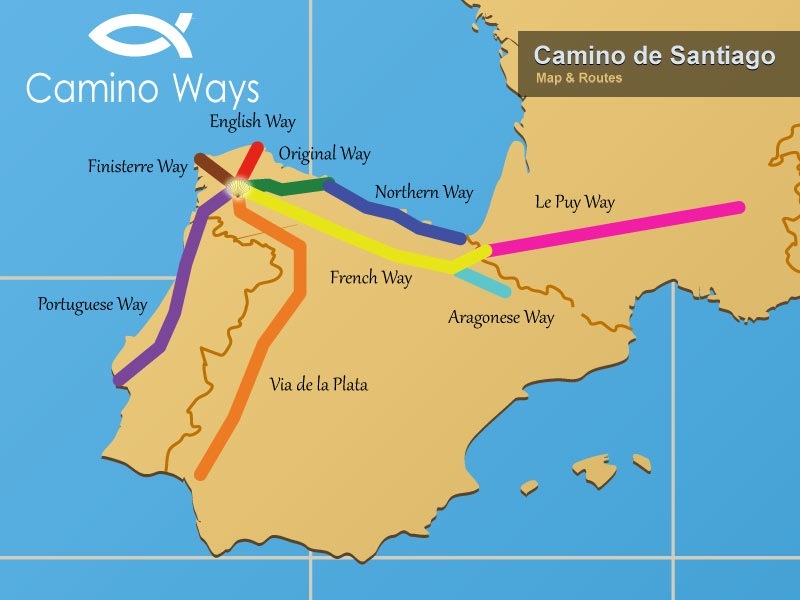 2018 brings a third camino (Camino de la Plata), but it is from the Southern tip of Spain to Santiago de Compostela and is yet another variation on the same theme. How did you find out about The Way? Many years ago, Mikey was a foreign exchange student in a small town called Getxo which is located near Bilbao in northern Spain. He traveled throughout the country on weekends and fell in love with the culture and people. Of particular interest was the devoutness of many Catholic Spaniards and various aspects such as their penchant for pilgrimage. Frank called a few days later and began the conversation with a simple, “When do we leave?” Yeah, Frank’s cool – but Mikey is obsessed! As for Mikey’s most tolerant and loving mother, Nancy encouraged Frank to walk with their son on a “once in a lifetime” pilgrimage. But…once was enough! (By the way, Mikey totally understands how hard it was for his mom to run the house alone for almost 2 months and is forever grateful to her for such grace, poise, and understanding as the two men in her life galavanted across Spain!) Ergo, an unattached Mikey has much less responsibilities and doesn’t want to put his mother through another prolonged separation from Frank or his father through another grueling hike! Why is the walk so far? By medieval standards, this 1150km (715 mile) pilgrimage is not that far. A popular Camino saying goes that the Camino begins at your front door. As such, most pre-modern pilgrims would walk from their doorstep to Santiago – and then walk back home! We guess that modern conveniences like planes, trains, and automobiles have made the journey much easier for the current masses. Do you have to walk the whole way? Yes, most pilgrims (Mikey included) intend on completing every step on foot, but this is not always possible. Moreover, many European pilgrims complete various segments of an intended route over months or years, splitting the Camino up over annual vacations and such. Conversely, most Americans are limited by the cost of airfare and decide to make their entire pilgrimage to Santiago in a single trip. Also, there are a growing number of pilgrims who opt to complete the Camino routes via bicycle, horse, or even motorcycle. Although Harley-going pilgrims do not qualify for a Compostela, cyclists and horse jockeys do, so long as they compete the last 200km (as opposed to walking the last 100km). See, the Church gets it! That’s a good question and it really depends on what is available. Unlike the Pacific Crest Trail or the East Coast’s Appalachian Trail, most pilgrims do not camp in tents. Yes, they do carry sleeping bags, but most opt to stay overnight in accommodations which vary from hotels, hostels, and even monasteries. The most popular option is a hostel like venue known as an “albergue” (pronounced: Al-BEAR-gay)…yeah, hold the jokes! These either public or private hostels feature varying layouts of bunkbeds arranged in pods or sometimes vast dormitories of 100+ beds. As such, Mikey travels with earplugs! The cost is normally 5-10€ (about $7-12) per night and sometimes includes a breakfast consisting of coffee and toast. Sure, it’s not the Ritz, but it gets the job done. Mostly though, one takes what he can get. That is to say, if the albergues are full, a pilgrim can either walk to the next town or try to find a hotel. While this isn’t the norm, a decent hotel is often available for around 30-50€ ($37-62) and can even be reserved on the same day through hotel-booking phone apps. Again, unlike many outdoor hikes in the US wherein trekkers must carry and cook their food, the Camino routes run through countless hamlets, villages, towns, and some major cities. As such, food is normally available in cafes and restaurants. In fact, many of these townships are supported almost entirely by Camino traffic and close up shop in the winter months during which inclement weather precludes much foot travel. Sure, most pilgrims carry fruit, nuts, and, of course, water, but meals are readily available for purchase or may be cooked communally in the hostels’ provided facilities. The latter option even allows for opportunities to meet other travelers and share a meal quite foreign to the American palate. Still, most pilgrims opt for a light breakfast of toast and coffee (2€), a mid-morning snack such as a sandwich (3-5€), late afternoon tapas (~3€), and an evening “Pilgrim’s Menu” dinner (8-12€). Just a quick word about the “Pilgrim’s Menu”: AMAZING! This normally consists of a salad or soup to start, a main carbohydrate-rich entrée featuring locally sourced meat/fish, dessert, and a FULL bottle of wine! Yeah, just try to find that deal in the States!! How much does this pilgrimage cost?! This is a most common question and the answer is probably surprising: not a lot. That is to say, if we add up accommodation, meals, and snacks, a “Camino day” averages around 30-40€. Perhaps the larger question remains: OMG, why is the Camino so cheap and why am I not vacationing on it?! To put it bluntly, yes, a ~$40-50 per day, all-inclusive vacation sounds amazing. Still, pilgrims carry all their belongings on their backs and walk an average of 16-25 miles per day. If this physical challenge still remains appealing to you, please follow Mikey’s blog and get in touch with him. Let’s face it, if an out of shape and overweight Mikey can complete the trip with his father one year, goes back the following, and STILL wants to attempt it again, what’s stopping you?! What about your backpack? What do you take with you? Glad you asked! Just two years ago, Mikey would have provided a laundry list of all things possible. With a bit of experience under his belt, he now says – not a lot. Remembering how heavy his pack was (and that it is recommended to carry no more than 10% of ones body weight – e.g., a 200lb pilgrim should carry NO more than 20lbs), Mikey is hard at work to pare down even last year’s packing list! Are you Catholic? Is that why you’re walking? Nope – and don’t wanna be. OK, that’s a bit of a joke. In all honesty, Mikey was NOT raised Catholic, but does appreciate all believers. I mean, we live in a hard world and Mikey is the last to judge anyone’s belief system. Perhaps the better question is: Why are you walkinG yet another Catholic pilgrimage if you aren’t Catholic? Oy-vey! Well, maybe Mikey is still in love with the culture he engaged with many years ago as an exchange student? Maybe he is a certified masochist who would rather spend his vacation climbing mountains and sleeping in uncomfortable bunkbeds every night as opposed to living it up at some Cancun resort? Maybe he’s a cheapskate who looks only at the dollar value of this walking vacation? Call it a Kerouacian call to “The Road” or what have you, but the Camino is the closest he can muster to the European Grand Tour of the Enlightenment age. It fully encompasses the history, culture, religion, and, now, geopolitical modernity of Iberia and the rest of Europe. 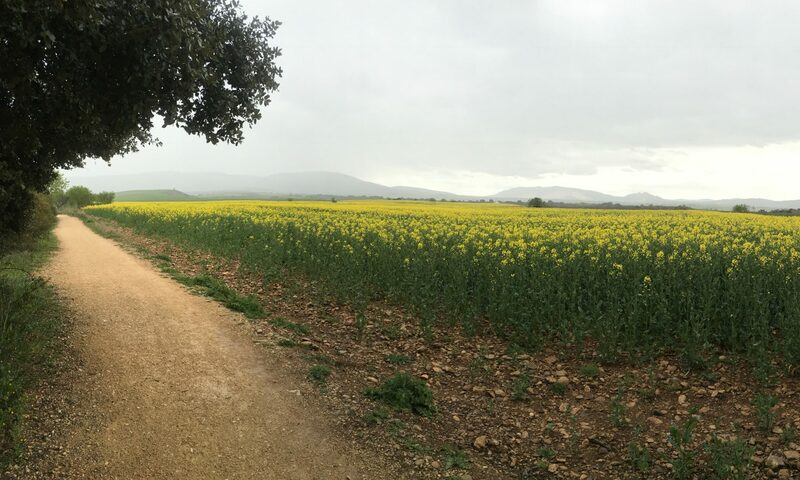 To walk the Camino is to learn equally about Spanish culture and about one’s self. Physical, mental, emotional, and spiritual challenges abound – how would you deal with them?